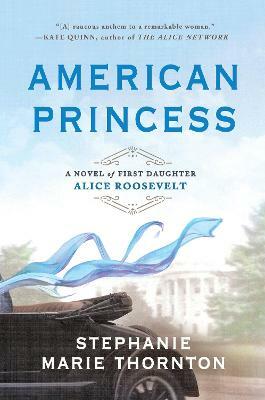 Presidential darling, America's sweetheart, national rebel: Teddy Roosevelt's swashbuckling daughter Alice springs to life in this raucous, rollicking anthem to a remarkable woman. --Kate Quinn, New York Times bestselling author of The Alice Network A sweeping novel from renowned... read full description below. Presidential darling, America's sweetheart, national rebel: Teddy Roosevelt's swashbuckling daughter Alice springs to life in this raucous, rollicking anthem to a remarkable woman. --Kate Quinn, New York Times bestselling author of The Alice Network A sweeping novel from renowned author Stephanie Marie Thornton... Alice may be the president's daughter, but she's nobody's darling. As bold as her signature color Alice Blue, the gum-chewing, cigarette-smoking, poker-playing First Daughter discovers that the only way for a woman to stand out in Washington is to make waves--oceans of them. With the canny sophistication of the savviest politician on the Hill, Alice uses her celebrity to her advantage, testing the limits of her power and the seductive thrill of political entanglements. But Washington, DC is rife with heartaches and betrayals, and when Alice falls hard for a smooth-talking congressman it will take everything this rebel has to emerge triumphant and claim her place as an American icon. As Alice soldiers through the devastation of two world wars and brazens out a cutting feud with her famous Roosevelt cousins, it's no wonder everyone in the capital refers to her as the Other Washington Monument--and Alice intends to outlast them all.